The newly confirmed ambassadors presented their credentials to each of their receiving states in the last couple of months. Below are just a few of the photographs that are available online. On August 21, 2009, Ambassador Matthew Barzun presented his credentials to His Majesty King Carl XVI Gustaf, in a formal ceremony marking the official recognition of a foreign Ambassador in Sweden. 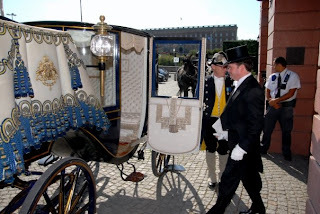 The ceremony, with its accompanying formalities, such as the horse-drawn parade carriage and full formal dress celebrates the Swedish royal traditions in the modern Swedish state. A video of the ceremony is here. Ambassador John V. Roos presented his credentials to the Emperor of Japan on the afternoon of August 20, 2009. 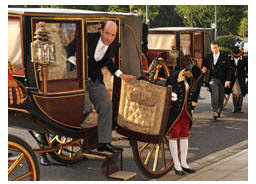 The Ambassador traveled to the ceremony at the Imperial Palace in a carriage provided by the Imperial Household, departing from and then returning to the Meiji Seimei-kan. View more photos here. Ambassador Philip D. Murphy with German President Prof. Dr. Horst Köhler during the presentation of his credentials. View photo gallery here. U.S. 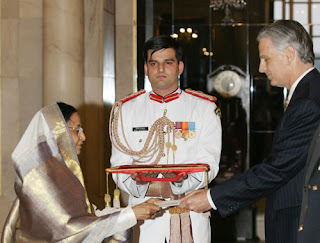 Ambassador Timothy J. Roemer presenting his credentials to the President of India Pratibha Patil in New Delhi on August 11, 2009 | View photo gallery here. The new Ambassador of the United States in Haiti, Ambassador Kenneth H. Merten, has arrived Port-au-Prince. On Monday August 24, 2009, he presented his letters of accreditation to the President of the Republic, his Excellency Rene Préval. 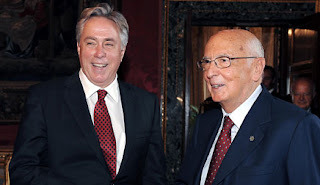 Roma, 4 settembre 2009: David H. Thorne, nuovo Ambasciatore degli Stati Uniti d'America, incontra il Presidente Giorgio Napolitano, in occasione della presentazione delle Lettere Credenziali. October 2 - The U.S. 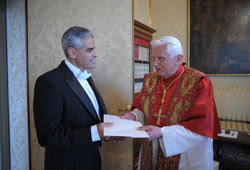 Ambassador to the Holy See, Miguel H. Díaz, presented his letter of credentials from President Barack Obama to Pope Benedict XVI at the Apostolic Palace of Castel Gandolfo. 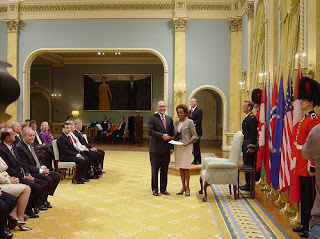 On October 2, 2009 David Jacobson presented his credentials in Ottawa to Right Honourable Michaëlle Jean, Governor General of Canada. David Jacobson is now the 22nd United States Ambassador to Canada. View more photos here. October 13 - The Ambassador of the United States of America to the Court of St. James's, Louis B. Susman, presented his diplomatic credentials to Her Majesty, Queen Elizabeth II, at Buckingham Palace. The Ambassador was accompanied by his wife, Marjorie, and four senior members of the Embassy staff – Richard LeBaron, Dorothy Lutter, Gina Haspel, and Adm. Ronald Henderson. Ambassador Susman is the 70th representative of the United States in Great Britain. 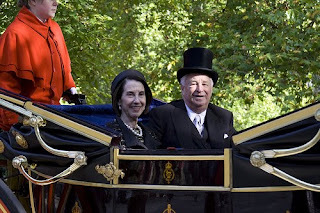 Photo above of Ambassador and Mrs Susman on their return in a horse-draw carriage from Buckingham Palace. View more photos here (no photo with the Queen).